Mandela: Long Walk to Freedom is the film adaptation of the late Nelson Mandelas autobiography. 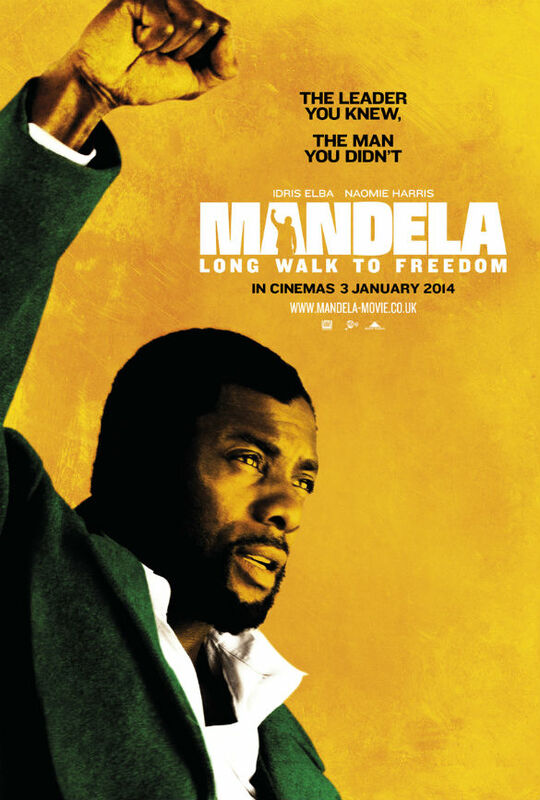 The film stars Idris Elba as Mandela and Naomi Harris as Winnie Mandela (Nelsons wife). Unfortunately, this film is plagued by its source material. The book, which I have read, is excellent, the film is less so. I was truly willing this film to be better. Elba is one of my favourite actors, due to his performance as the title character in Luther and at the time of filming he was my favourite to receive an Oscar for this performance, but unfortunately it was below that calibre. That is not to say that his performance was anything short of excellent, simply that there were better performances in the movie year. The book is so unbelievably thorough, it delves into the dark times Mandela spent in prison as well as his time in hiding. The film simply fails to translate these moments. This is due to the fact that the book is so large, it is absolutely impossible to get across everything that happens. By picking the so called best moments of the book, it fails to show the extraordinary life which Mandela led in any truly meaningful or deep way. One of the main issues with the film is the bizarre way that Nelson and Winnies relationship is portrayed, it’s highly confusing for the audience. Throughout the film they have almost separate, yet parallel character journeys. Both have to suffer for their beliefs, but both react to this suffering in different ways which ultimately pulls them apart. However the impact of their ever distanced relationship appears very minor to both the characters. No anguish is portrayed about their relationship and Winnie seems to not care that her husband is in prison for twenty years. There is no emotional impact, which I found surprising. The film always feels like it has a big moment, an emotional speech or an act of rebellion, waiting to happen, but I was left waiting for something that never came. There are several emotive speeches in the film, but only one was really moving. There lacked a sense of realism to the speeches, to the reactions of the crowd. Maybe the overly emotive soundtrack distracted from what could of been more sincere moments. It’s difficult to put your finger on, but there is simply no real ‘goose-bump’ moments in the film. I expected these moments based on the source material. I feel that due to the fact that its source material is so thorough the film would have done better to portray a short period in Mandelas life rather than the whole thing. This would have resulted in a far more complete film. But the director bit off more than he could chew, which resulted in a film that lacked any fresh insights into Mandelas extraordinary life. What makes the book absorbing is the way that everything is described. It is very difficult for a film to portray 27 years in prison in the space of 10 minutes. This is exactly what ruins the film. I don’t know whether this makes the director overly ambitious or simply naive. It must also be said that this film is not awful. It has its moments. The acting is strong, but then what’s entertaining about the film is the subject matter and not the portrayal. The film does nothing cleverly or nuanced or anything other than what you expect. It is therefore a thoroughly average film. I’m sure people will enjoy it, I didn’t hate it myself, but its just not the film it had the potential to be. I would give this film a rating of 5 out of 10, as it is an average film which could have been so much more. If you felt differently about the film I would love to know your perspective so feel free to comment.